One of the more curious things said by Jackie Walker, recently suspended by the Labour Party and removed as Vice-Chair of Momentum (although retained on its Steering Committee) for comments she made at a Labour Party training event on antisemitism, was that she hasn’t “heard a definition of antisemitism that I can work with”. Any crime that is motivated by hostility on the grounds of race, religion, sexual orientation, disability or transgender identity can be classed as a hate crime. provisions for enhanced sentencing where a crime is motivated by race, religion, sexual orientation, disability or transgender identity. Hate crimes and incidents are taken to mean any crime or incident where the perpetrator’s hostility or prejudice against an identifiable group of people is a factor in determining who is victimised. CST classifies as an antisemitic incident any malicious act aimed at Jewish people, organisations or property, where there is evidence that the incident has antisemitic motivation or content, or that the victim was targeted because they are (or are believed to be) Jewish. CST divides antisemitic incidents into six categories: there are detailed descriptions of these categories in our leaflet, Definitions of Antisemitic Incidents. CST deals with antisemitic discourse differently from incidents, and CST’s Antisemitic Discourse Reports contain a selection of legal and non-legal definitions of antisemitism. Such manifestations could also target the State of Israel, conceived as a Jewish collectivist [sic]. Antisemitic hostility frequently charges Jews with conspiring to harm humanity, and is often used to blame Jewish people for ‘why things go wrong’. It is expressed in speech, writing, visual forms and action, and employs negative stereotypes and character traits. What do Jewish people think is antisemitic? 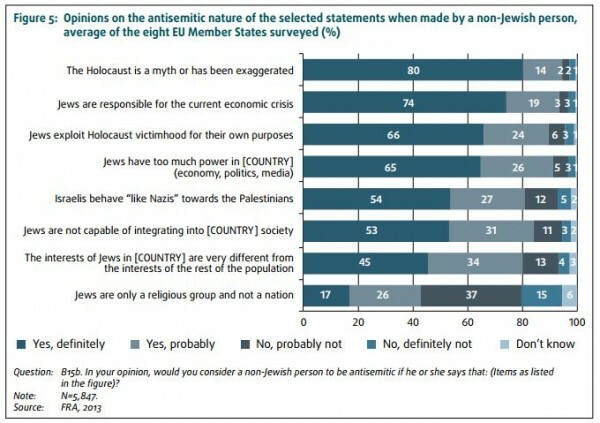 As these tables show, overwhelming majorities of Jews think that denying the Holocaust or accusing Jews of exploiting it for their own ends are probably or definitely antisemitic. The same goes for blaming Jews for the economic crisis, saying they have too much power and saying they can’t integrate into their countries. Where Israel is concerned, 81% of Jews in the survey think that comparing Israel to Nazi Germany is probably or definitely antisemitic. Nearly three quarters think that somebody who boycotts Israeli goods is probably or definitely antisemitic, but only 34% would say the same about somebody who criticises Israel. Taken together, these definitions represent a remarkable consensus across 31 governments, the UK Police, the National Union of Students and the opinions of Jews in eight European countries. If Jackie Walker – or anyone else – can’t “work with” these definitions, then instead of suggesting that these definitions are no good, perhaps it is Walker who needs to change her way of thinking about antisemitism. After UK Media Watch complaint, Independent furtively corrects false claim. She doesn’t have to “work with” anything. Her statement is pretentious and self important. My facts may require some checking here, but it is my belief that Ms Walker’s ethnicity is a mixed one. She shares a Jewish background with what I believe is an African Caribbean one. She is more to be pitied than condemned because she is unable to “work with” her own situation let alone any other. From my observations it would appear that she has chosen to identify with her non-Jewish antecedents and thereby to be repelled by her Jewish past. Her defence is “I cannot be anti-Semitic because I am a Jew myself” which is often these days invoked to beat the “some of my best friends….” argument. Jackie Walker’s predicament is a gift to psychiatric research, but it is very far from being relevant to the Labour Party’s failing attempts to adequately represent the working people of Britain. ‘ Her defence is “I cannot be anti-Semitic because I am a Jew myself” ‘ as often stated by the antisemitic Jews whose letters are so readily published by The Guardian. If she wants a good definition of antisemitism all she has to to do is look in the mirror. She’s as Jewish as Obama is white. The term “Palestinians” itself if a an antisemitic myth, which many assaults and blood libels against Israel are based on. The Arabs who are wrongly being called “Palestinians”, came from different and separate TRIBES, from many countries in the middle east, north Africa and even East Europe. They live in tribes and keep a tribal culture, in which the individual is loyal only to the family – to the tribe. People of one tribe NEVER get married with people of the other tribes. Even the Arabic dialect is different! Tamimi, Hijazi, Qawasma, Natshi, Ja’abri, Abu-Sanina, Abu-Sita, Tarabin, Fayumi, Tartis, Al Masri, AL-Carmi, Al-Ubid, Mugrabi, Halabi, Hurani, Bushnak, Tukan, Sha’an, Abbas, Arikat, Baraguti, Tuyad, Trubalsi, Saidani, Yamani, Sultan. Husseini, etc. The twisted Hebrew adjective “Palestinians” is originally “Plishtim” (פלשתים) means in English: Intruders (in the passive form – “Those who are being intruders”). The people who originally were referred by these adjective in bible came from Crete and has nothing to do with the modern Arab migrants and there’s a gap over 2 millenniums of history between them! Also, the intentional law, created by the League of Nations (the UN today) in 1922, which is based on the San-Remo treaty in 1920, clearly defines the land they called “Palestine” as the national land of the Jewish people. That’s 45 years before the cease fire Green Line was drawn on Judea and Samaria (A ridge of mountains – not a bank). That makes the “Israeli Occupation of Palestine” – another antisemitic lie against the only Jewish country in the world. Wouldn’t it be so much quicker and simpler to buy her a good dictionary ?